Rec RoomHearty recommendations from The Takeout staff. Welcome to The Takeout’s Garlic Week, our Valentine to the world’s loveliest stink. Of all the impulse buys I’ve made at Missoula’s Clark Fork farmer’s market—expensive mushrooms, melons I can’t pronounce, decorative gourds—only the garlic braid has proven itself indispensable. I purchased it late last summer from an older woman whose stall I generally overlook. Her table is modestly sized and relatively monochrome, a humble contrast from others vendors’ rainbow chard, zebra-striped tomatoes, and splashy peppers. This woman sells only garlic, their purple-and-gray stalks resting quietly amid the markets’ colorful cacophony. Week after week, month after month, she lays out her single product, either by the head or with their stalks woven into interlocking braids. I’d repeatedly overlooked her stall not only because I was distracted by the more eye-catching produce elsewhere, but because garlic didn’t strike me as a food I needed to buy from a farmer’s market. Conventional, grocery-store tomatoes are universally derided; same goes for strawberries. But humble alliums? I can just pick those up at the supermarket, I figured. Oh, how naive I was! How misguided! The garlic braid is now essential in my kitchen, as necessary as a salt cellar or pepper grinder. I share this story so that when farmer’s markets open for the season and you come across what appears to be an expensive garlic braid—I paid about $30 for mine, which contained 12 heads of garlic—you will not first balk and overlook it as I did, but will slap your cash down and nestle that braid in your public-radio canvas tote bag. 1. You get a lot. I have never accidentally run out of garlic since purchasing this. In the past, I might have been tempted to reduce the quantity of garlic in a recipe if I’ve unexpectedly used my last clove—a terrible crime for those of us who love its piquancy—but I’ll never suffer that again. I have what is essentially a constant source of garlic in perpetuity, or at least until I need to buy another braid at next year’s market. 2. This is some powerful garlic. Saving the full conversation about the virtues of hardneck garlic for another day, suffice to say hardneck garlic of the type you’ll find at farmer’s markets is like regular garlic that’s guzzled Brawndo. Its cloves are comparatively huge, and its flavor is formidable. I actually tear up when slicing these cloves, much as I do with onions. The oils contained within each little nugget are so strong that they’re nearly spicy, leagues apart from the supermarket stuff. Told you they were big cloves! The hardneck garlic is cured, meaning it keeps much longer than regular garlic (which has a tendency to sprout while sitting on your counter). And because each individual clove is so much larger and more flavorful than a conventional one, I can often use fewer individual cloves than a recipe calls for. 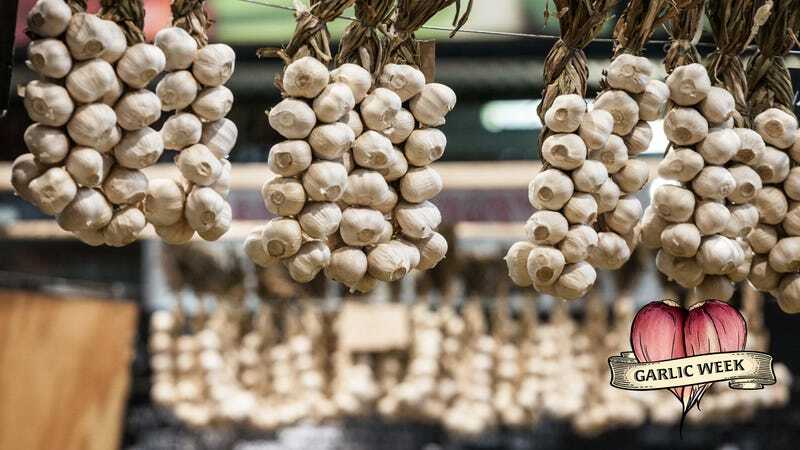 For the quality of garlic flavor, the roughly $2 per head is worth it. Hey, kitchen aesthetics matter; it’s why KitchenAid offers something like 400 color choices for its stand mixers. Garlic braids look organically attractive in that canning jar-, twine-, dairy bottle-rustic sense. When it’s the middle of winter and the wind howls with double-digit-below-freezing chills, I especially value the visual reminder of summer’s bounty.